Hillary Clinton is expected to be the overall winner come November, but from the past events, nobody should brush Trump off. He has exceeded the expectations of people ever since he announced his bid for presidency and in most people’s opinions, he might be the next POTUS. The article below focuses on some of the past primaries and how various contenders have fared on. Primary vote held here saw huge victories for Bernie Sanders and Ted Cruz, a factor which should give the two the momentum that they need as they head into the New York primary. Ted Cruz dominated the Southeastern part of the state and claimed most of the Urban districts while Donald Trump won the rural areas. Sanders, on the other hand, won almost every country outright but was still very close in percentage with Hillary Clinton. Regardless of the momentum that they gained in Wisconsin, there has been very little change in the odds. The Republican and presidential odds for 2016 have seen Ted Cruz catch up with Donald Trump, while Sanders compensated for the odds of becoming the Democratic representative in the 2016 election. Primaries conducted in New York had the results come out as most people would have expected with Donald Trump and Hillary Clinton cruising to huge victories. Even though the huge win had very little impact on Trumps presidential odds of winning the Republican nomination, the massive loss of Bernie Sanders has seen him drop behind the lines of becoming the next Democratic nominee to dangerously long shot levels. Bernie Sanders had insisted that he was the favorite candidate to win the New York primaries, but the Brooklyn Born presidential aspirant got thumped and lost in New York by close to 20%, figures which represent almost one-quarter of a million votes. According to the presidential odds paddy power, Bernie Sanders was the underdog when it came to winning the Democratic torchbearer as they headed into the New York primary but the results of the pole saw hiss Democratic odds of winning the nomination plunge to 100/1 within a period of 48 hours. On the other hand, Hillary Clinton witnessed her Democratic odds of winning the nomination double following her win at New York. On the Republican front, very few people would doubt that Trump would be defeated in his home state, but the Business Tycoon controlled the competition by winning 89 of the 92 delegates. Consequently, the win saw his Republican presidential odds paddy power of winning the torchbearer shift slightly for Donald Trump. By then, there was still a realistic chance that he, Donald Trump, could get more and more numbers to win the nomination automatically. By the time the New York primary was conducted, there were still nine states, which were remaining. In this, the GOP leader would take all the delegates including the State of Cali. When all the nine states are combined, it could see a total of 497 delegates with Trump only needing 393 to reach his target of 1237 which he needed for his nomination as the next Republican nominee. These figures aren’t inclusive of the six other states which will see the delegates calculated on a percentage basis. From the New York primaries, it was evident that Donald Trump and Hillary Clinton expanded their presidential odds for 2016 over the other candidates in their respective parties even though the potential Democratic torchbearer is still the odds-on favorite according to 2016 presidential odds paddy power. Sanders has continued proving that he is a commendable challenger and potential danger to what most people thought was an automatic – Hillary Clinton becoming the torchbearer of the Democratic party into the 2016 presidential elections. Bernie Sanders won the Oregon primary and tied in points with Hillary Clinton in the Kentucky primaries. Even though Hillary Clinton won the primaries in the Bluegrass state, she only did it by half a percentage point. The former first lady spent huge sums of money in the Kentucky campaign but ultimately ended up sharing the spoils with Sanders. From history, this is a huge blow to Clinton, who won the state by a huge 35 points in the 2008 elections. However, despite her loss, the results had a very small impact on the 2016 presidential odds markets. Hillary Clinton and the possible Republican torchbearer in the 2016 presidential race saw their numbers differ slightly with Bernie Sanders seeing his odds of becoming the president of the United States remain the same. Trump also won the Republican primary in the Washington state on May 24, 2016. However, the next set of primaries that will determine most of the party nominees comes on June 7, 2016, when Cali and five other key states take to the ballot to vote. The Golden state will be the last huge primary and could be the key to determining who will be the Democratic torchbearer into the 2016 elections with up to 546 delegates up for grabs. As you are aware, Paddy Power is one of the leading online bookmakers in Europe, and it offers competitive odds for the presidential candidates. The section features the main US presidential aspirants as well as other sections that contribute to electing the next POTUS. These sections include the Democratic presidential nominee, the Republican presidential nominee as well as their vice presidents. 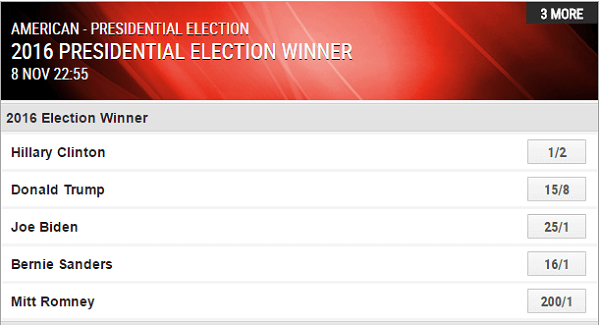 Ladbrokes is the other bookmaker that offers a punter a chance of placing bets on the next POTUS. Unlike Paddy Power, it has an extra slot that accommodates Mitt Romney as an aspirant with odds of 200/1. To get a comparison of some of the 2016 presidential odds offered at various websites, you can visit odds checker for the latest and updated info on the odds.